What can I say? I like swirls... thus, I like this friendly little village "where everyone gets along" according to its creator, Missouri paper cut artist, Jacqueline Basham. The intertwined circles and Jackie's description started me thinking about the online paper art and craft community, and the way we share and inspire one another. Jackie has an Etsy shop called Smooth Pebble [edit: no longer stocked], where you'll find more of her paper cuts that she creates with an X-acto, archival paper for the most part, and the occasional old map. She also has a lovely [and currently inactive blog] called Smooth Pebble. You might enjoy Jackie's latest post called Thank you. May it grab a hold of your thoughts on creativity and shake them up just a little, the way it did mine. Have a wonderful weekend, my fellow paper enthusiasts. I'm going to follow Jackie's lead and take a stab at having a computer-free couple of days... with any luck some creating may actually occur! 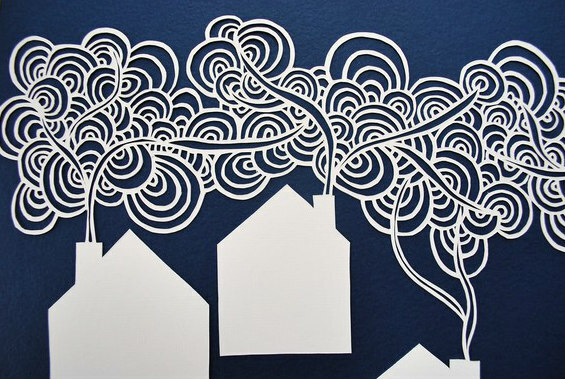 I so want to try paper cutting , this is so inspiring.The curves do look like it will take lot of practice. Her thank you post does make me feel like I know what she is talking about. At least the escaping part. wow...thanks for linking us to Jackie's blog. Not only is her paper cutting AMAZING but she has a beautiful way with words and helping (me anyway) look at things just a little differently (and she was dead on). I am going to try it this weekend too....see you all Monday. I totally agree with what you have said about our little 'online world', Ann. Thanks also for the link to Jackie's blog and her words of absolute wisdom. Maybe we should all follow her example and take pause for thought now and then. I hope you enjoy your break. Thanks Ann.. so true.. have a lovely couple of computer free days.. thanks too for the link to Jackie's..her post is great and so is her work.. think what she said is sooo true and maybe something I need to practice as well.. These swirls are so fabulous, can't take my eyes off these pictures. Am off to check out their site as well. oh yes I love this; it's ... charming.